Tawhiri and Tanya bring complementary skills to the business, and working together has already seen them successful in establishing building industry businesses. Tarf as an entrepreneurial, trade qualified builder and Tanya as a creative systems and process person, combine to offer sound experience and knowledge in the industry. Tarf was raised on a farm with an attitude for hard work. He left the farm on the advice of his grand father as a teenager and went to a private boarding school in the Hawkes Bay. In 1994 Tarf moved to Blenheim where he started his own business in the forestry industry employing over 30 staff. A move to Auckland and a Diploma in Leadership saw him take on a role as a self-employed contractor within Coca-Cola. Tarf was dominant in sales for the Auckland region and set records at Coca-Cola. It was at this time that Tarf met Tanya. Tanya is a CODA (Child of Deaf Adults) and was raised in the deaf community with NZSL as her first language although she herself is hearing. Tanya’s background is within the Social Work sector and she studied and received a First-Class Honors degree in Social Work. This then led her to work for Women’s Refuge and advocating for women and children to have the right to have a safe and violence free home environment. Although creative by nature, it is Tanya’s ability and passion for structure and systems that has made her an asset for the business. Tanya has also held positions leading volunteers and event management in the not for profit sector. Tawhiri and Tanya married prior to relocating to Whanganui with their two boys in 2005. Their third child, a girl arrived on the scene in 2007 completing their family. With Tawhiri’s entrepreneurial passion and Tanya’s flair for the creative, they set about establishing a well-respected local home handyman business maintaining and servicing 450 homes in the region. Tarf underwent his apprenticeship at this time and as enquiries for full house renovations and extensions started to come in, the nature of the business changed. This ultimately led-to the company being recognised as a reputable renovations and alterations company. From there they were also nominated and shortlisted as finalists in the 2017 Te Manu Atatu Maori Business Awards. They were also the building contractors for the award-winning house in the Alterations and Additions Division at the NZIA West Awards Ceremony. Tawhiri and Tanya are excited about joining the Sentinel family and being able to share their passion for designing and building, beautiful, functional homes for clients. 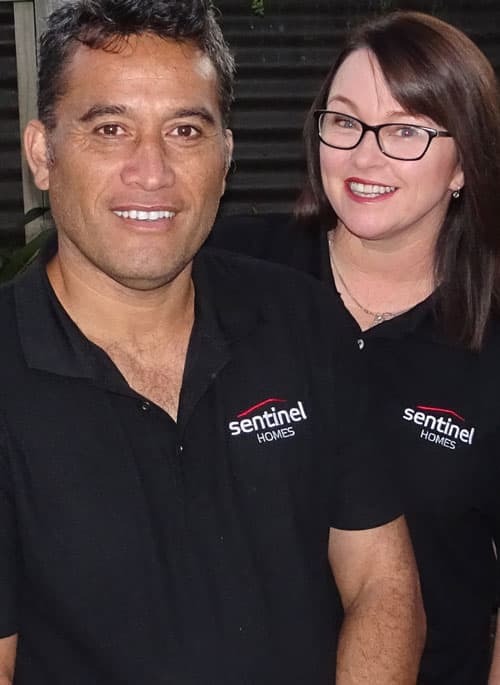 Contact Tawhiri and Tanya today to enquire about how we can work with you in building your Sentinel Home.